University of Freiburg (German Albert-Ludwigs-Universität Freiburg ), sometimes referred to in English as the Albert Ludwig University of Freiburg, is a public research university located in Freiburg, Baden-Württemberg, Germany. The university was founded in 1457 by the Habsburgs, becoming the second university in Habsburg territory after the University of Vienna. Today, Freiburg is among the oldest universities in Germany, with a long tradition of teaching the humanities, social sciences and natural sciences. It is considered one of the most prestigious universities and a leading research and teaching institution in Europe.The university is made up of 11 faculties and attracts students from across Germany as well as from over one hundred and twenty countries. The University of Freiburg was designated a German "University of Excellence" in 2007. The University of Freiburg was founded by Archduke Albrecht IV of Austria in 1457, the second university on Habsburg territory after Vienna. As was typical of universities in the late Middle Ages, the university originally consisted of four faculties: Theology, Law, Medicine, and Philosophy. Most students were from southwestern Germany, Alsace, Switzerland, and Austria. When Freiburg and the Western Austrian Breisgau fell to the Grand Duchy of Baden in 1805, the fate of the University of Freiburg was uncertain. Thus, when Grand Duke Ludwig of Baden arranged an endowment in 1820, the university celebrated him as its second founder. 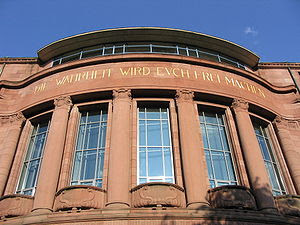 To this day the Albert-Ludwig University of Freiburg honors both Albert (the Latin spelling of Albrecht) and Ludwig in its name. Documentation of many lectures and timed debates has been handed down to us, allowing us to make a fairly vivid reconstruction of academic life in the early years of the university. The University of Freiburg was able to make a good reputation for itself in its early years and produced many well-known scholars and personalities, including Johannes Eck, Ulrich Zasius, Jakob Locher, Thomas Murner, Heinrich Glarean, and others. The universities in the German Empire were not able to escape the denominational polarization which followed the Reformation. 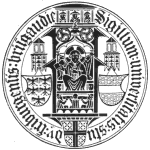 In Catholic Freiburg, the local princes put the Jesuits in charge of many departments of the university, including the entirety of the Faculty of Humanities and much of the Faculty of Theology. In the 17th century, the educational philosophy of the Jesuits stood for modernity and humanist ideals. The university received new impetus even before the reforms of Maria Theresa and her son Josef in the Age of Absolutism, who in 1768 compelled the university to accept a new constitution and the rector to wear a badge of office in addition to his scepter. Several decades before this the university had already introduced modern languages, dancing, and fencing to its curriculum to cater to the needs of the aristocratic students of the time. By the end of the 18th century many denominational limitations had been done away with and the university was well on its way toward becoming a secularized and tolerant educational institution, ideals which Johann Georg Jacobi, the first protestant rector of the university, stood for as well. The University of Freiburg remained comparatively small for a time after being incorporated into Baden despite the fact that it brought forth many personalities well known for their progressive ideas, such as Karl von Rotteck or Karl Theodor Welcker. It was not until the 1880’s that a surge ofan enormous development took place. Departments differentiated themselves from one another and became more specialized, and clinics and scientific institutes were founded on their own campus in the north of the old city. These years were also witness to an enormous increase in enrollment, which reached the plateaus of 500, 1000, and 1500 in rapid succession. By the time World War I broke out there were already 3000 students. This expansion led the state government of Baden to require professors to wear gowns starting in 1903. When the enormous expansion of the university made new buildings necessary at the end of the 19th century, it was decided that the university should remain in the heart of the city. The site chosen for the new University Library and the Main Building of the university, which were built between 1896 and 1911, was thus within sight of the oldest university buildings. This was a conscious decision for an urban university rather than a campus university. The University of Freiburg and its rector Martin Heidegger became a focus of public attention in 1933, and at the end of the war its buildings suffered severe damage from bombing raids. Between these two dates lies the suffering of Jewish members of the faculty and staff and of the professors who made it known that they opposed the Nazi regime. The main university building was also partially destroyed by a fire in 1934, but then rebuilt and expanded. Due to its proximity to the French border, Freiburg was in a dangerous position after the war began in 1939. For this reason the University of Freiburg was temporarily shut down during the war. Today, on the other hand, the Upper Rhine region represents a new opportunity to promote cooperation across national borders. The university was able to open its doors again and slowly resume operation only a few months after the end of the war. The reconstruction and repair of the buildings was largely completed by the 500th anniversary of the university in 1957, and this also marked the beginning of a further expansion of the university. Special priority in this new wave of expansion was given to programs in medicine and the natural sciences. New Profile or Old News? At the end of the 19th century the University of Freiburg was already known as an up-and-coming university whose size at times even surpassed its sister institution Heidelberg at the other end of Baden. Flourishing in the north of the old city was a new natural sciences campus, to which the hospital was added in 1926. 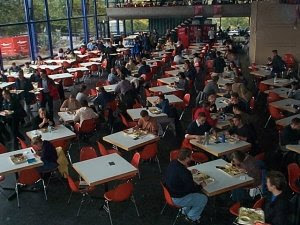 In the 1990’s this campus was expanded again to include the engineering departments. The University of Freiburg grew rapidly after the first wave of economic recovery in Germany in the 1950’s. Enrollment had stagnated at around 3000 between 1913 and 1950, with even less during the two wars, but by 1961 there were already 10,000 students. But even this was not the zenith: By the end of the 20th century enrollment was nearly at 25,000. It has gone back a bit in the past few years and now lies at about 19,000. 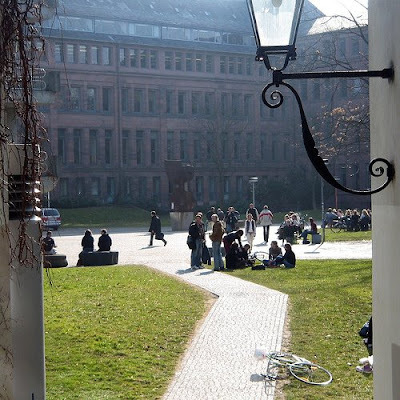 Freiburg is undoubtedly one of the most popular places to study in Germany. This is due in part to the quality of its academic programs, but the proximity of the university to France, Switzerland, and the Black Forest certainly contributes to the appeal the university has for many students as well. With its long tradition of excellence in science and research, the University of Freiburg has been home to some of the greatest minds. Among them are Hannah Arendt, Edmund Husserl, Martin Heidegger, Paul Ehrlich, Hans Adolf Krebs, Hans Spemann, and Friedrich August von Hayek, to name but a few. Among the distinguished affiliates, there are numerous Nobel laureates and Leibniz Prize winners.